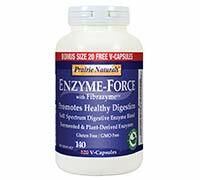 Prairie Naturals Enzyme-Force with FibraZyme™ is a full-spectrum digestive enzyme blend for the optimal digestion of proteins, carbohydrates, fats and fibre. Enzyme-Force does more than treat the symptoms; it helps to correct one of the underlying causes of indigestion – poor enzyme activity! These plant-based enzymes help support and maintain a healthy digestive system by breaking down all the food groups more thoroughly. Noticeable results include less indigestion, gas, bloating, constipation and acid reflux. Along with better digestion, increased energy and alertness are also reported. A full-spectrum vegetarian, plant-based enzyme blend in V-Caps! 100% VEGAN. TESTED GLUTEN-FREE. Contains NO soy, dairy, eggs, gluten, flavours, colours, preservatives, sweeteners, GMO ingredients.